Imagine if a novice taxidermy enthusiast from the United States is surfing the internet and sees a forum posting offering exotic skulls from Africa. Excited at the thought of adding something truly unique to his collection, he responds to the seller, strikes a deal, and a few weeks later a package arrives at his door. Unfortunately, without even being aware of it, he may have just stepped into the worst trouble of his life. He could face huge fines, jail time, and a felony criminal record as an illegal wildlife smuggler. Ignorance of the law has never been an excuse, yet some amateur collectors are risking everything by illegally importing wildlife into the United States. Just because someone is offering something for sale on the internet doesn’t mean it is legal for a US citizen to buy. And the importer, not the exporter, is the one who will end up in hot water over here. You should be aware that federal agents and law enforcement routinely monitor websites such as the Taxidermy Net for illegal activities. Anything you post on the World Wide Web can and will be used against you in a court of law or a sting investigation. With the vast resources of the government, it may be naive to think that one’s activity on the web is totally anonymous and private. 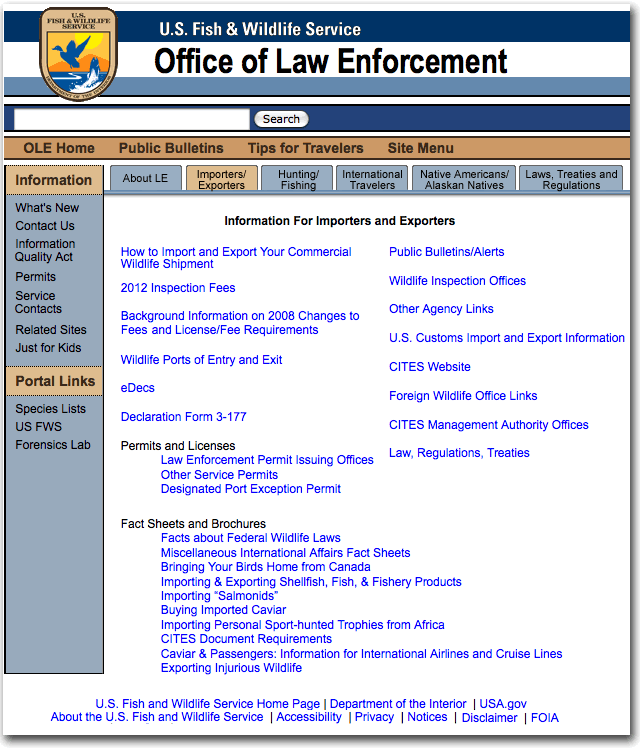 In most cases, importing wildlife into the United Sates will require permits and documentation for each species. Without the proper paperwork, you are now engaged in illegal smuggling, and that is very, very bad. If you are going to purchase specimens from out of the country, you will have to jump through a lot of hoops, and you must make sure to dot every “I” and cross every “T”. There is a steep learning curve. You will need to educate yourself first. There are several good places on the web where you can read all about the requirements. Click on the page above to visit the site at http://www.fws.gov/le/ImpExp/Info_Importers_Exporters.htm. Be forewarned, as with most government regulations, you can spend hours educating yourself and end up more confused than you were before you started! 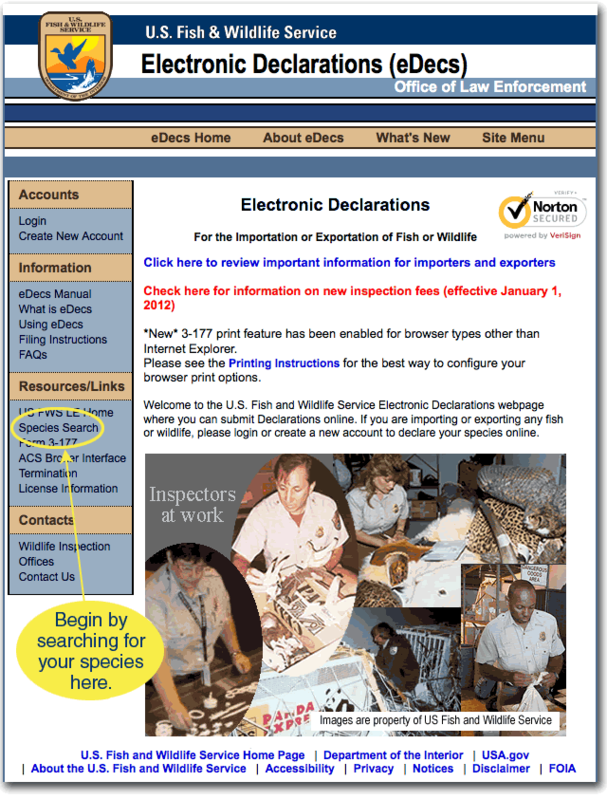 The eDecs website at https://edecs.fws.gov/ is a good place to read about importing specimens and the forms you will need to fill out. eDecs stands for Electronic Declarations. 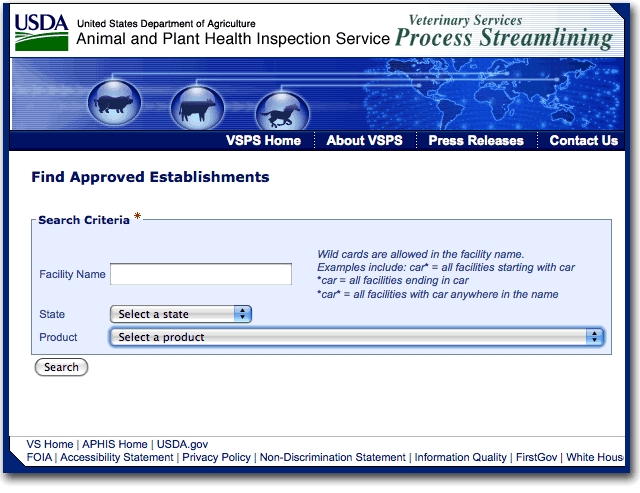 This site allows you to set up an account online and file the paperwork necessary for importing your declared species. Almost everything you need for importing can be found through this website. If you are bound and determined that you want to personally import wildlife from overseas legally, there are several steps you need to go through at the beginning to determine if it is even possible. First, identify the species. You must begin by determining the exact species (and in some cases, subspecies) of the specimen you wish to import. 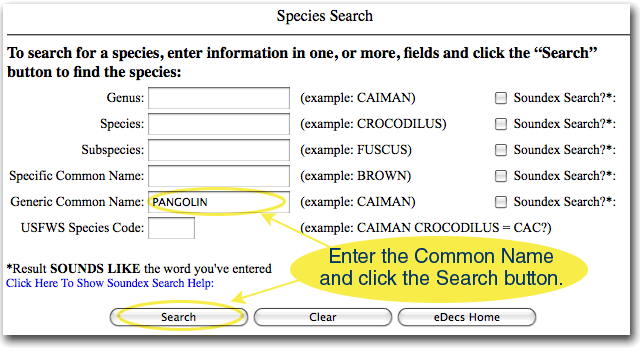 From the eDecs website above, click on the “Species Search” and enter the name in the “Generic Common Name” field. Then click on “Search”. If the search results yield no results, chances are you misspelled the name of the species. A good way to determine the correct spelling is to perform a Google search with the misspelled word. Google will usually come back at the top of the page with “Did you mean: …?” with the correct spelling highlighted. This is a great tool for many situations where spelling is questionable. If you can’t find the species in the eDecs search using the common name, you can always use the Latin name. Follow the Google search to Wikipedia and copy the Latin name, which is the genus (the first Latin name which is capitalized) and the species (the second Latin name which begins with a lower case letter). USFWS Code – The four-letter code designating each particular species which will be used in all of your paperwork. Genus, Species, Subspecies, and Common Name – The Latin name and the common name. CITES – If the species is listed under the Convention on International Trade in Endangered Species and which class (1, 2, or 3) it falls under. If the grid is colored with a yellow background, then the species is listed as CITES and requires special CITES paperwork. Notations – Special remarks pertaining to each species. Wildlife_Cat/Class/Family/Order – One-, two- and three-letter code designating these four classifications of your species. ESA – Endangered Species Act. E means endangered, T means threatened. Neither can be imported. MBTA – Migratory Bird Treaty Act. Trade is prohibited to all species indicated in this category. INJ – Injurious Wildlife. These are species which could have a devastating effect on the biological balance if introduced into an ecosystem. All live injurious species are not allowed to be imported, but some dead specimens can be brought in. MMPA – The Marine Mammal Protection Act covers manatees, polar bears, sea otters, and walruses. WBCA – The Wild Bird Conservation Act mainly deals with live birds, not dead ones. It is illegal to import any live CITES listed live bird, but some dead birds (skins, feathers, skulls) are allowed. Begin by looking to see if the species falls under CITES. CITES (the Convention on International Trade in Endangered Species of Wild Fauna and Flora) is an international agreement between governments. Its aim is to ensure that international trade in specimens of wild animals and plants does not threaten their survival. If the species is listed as CITES 2 or 3, it can be imported into the US, but it requires a CITES export permit from the country of origin. Upon export, the CITES permits must be validated (box 14 and 15 on the permit) by the Fish & Wildlife authorities in the exporting country. 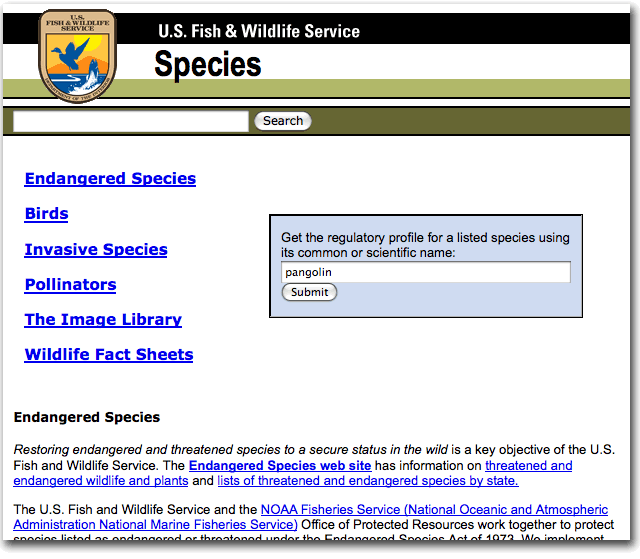 This is another page that will offer information on the legalities and restrictions of a particular species: http://www.fws.gov/species/. If you have determined that the species is not listed under CITES, ESA, MBTA, INJ, MMPA and WBCA, you are still not out of the woods. For instance, if you search for a Black-Casqued Hornbill, you will find that it is not protected by the above laws. You may think that you are in the clear for importing, but there is another important step that must be followed for all birds. If the specimen is a bird, the next step is to see if the exporting country is listed as a bird flu country. 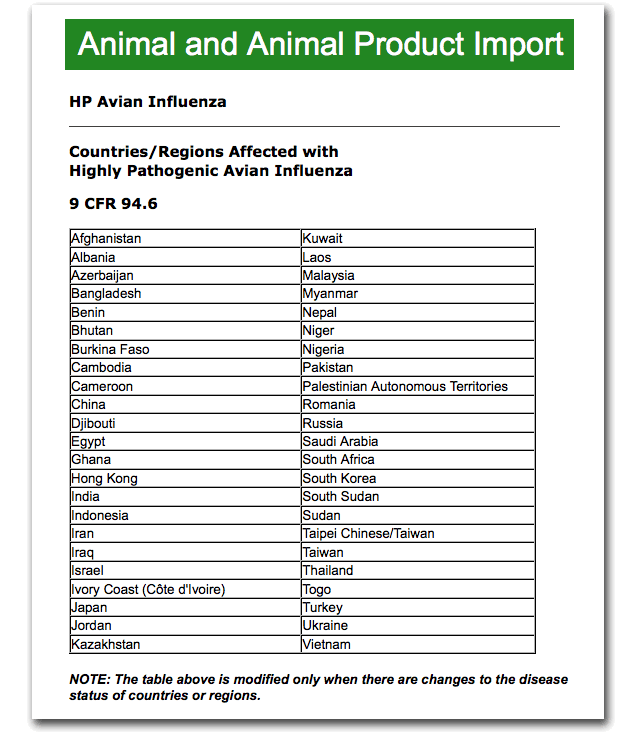 Go here: http://www.aphis.usda.gov/import_export/animals/animal_import/animal_imports_hpai.shtml to see if the exporting country is listed as a region affected with highly pathogenic avian influenza. If the country is listed, then you cannot import any bird from that country. The consequences of breaking the bird flu embargo are severe. If you accept a live or dead bird from one of the countries listed here, you could be subject to some huge fines and jail time, up to $250,000 fine and 5 years in prison for any individual, or up to $500,000 fine and 5 years in prison for any business or organization. As you can see, Cameroon is currently on the Bird Flu list. If someone sends you any bird from Cameroon, you could wind up in jail! Unscrupulous wildlife dealers may very well make their home in Cameroon, so beware! Ignorance of the law is no excuse. So if you have made it this far, everything checks out, the species is not listed on CITES, or if it is listed in CITES 2 or 3, the exporter has an export CITES permit, and they have all their paperwork and permits, you are ready to proceed with importing. You, as the importer will have to file a declaration of import with Fish & Wildlife by logging in at https://edecs.fws.gov/eDecsHome.cfm or printing a paper form 3-177 from the same website. There is an extensive set of instructions, a manual, and Frequently Asked Questions on the web site that will keep you busy for some time. You may import your shipment through any of the following USFW approved ports: Anchorage, Atlanta, Baltimore, Boston, Chicago, Dallas, Honolulu, Houston, Los Angeles, Louisville, Memphis, Miami, New Orleans, New York, Newark, Portland, San Francisco, and Seattle where it will be inspected and matched against your import declaration. Hopefully there will be no problems with the shipment. Basically, if the imported specimen is a bird, swine, rodent or primate, another taxidermist with a USDA approved facility must take care of all of the initial processing for each particular specimen, which may include special washing, dipping, burning refuse, etc., before they can release the specimen into your possession. This is not necessary for fish, snakes or most ungulates. Once everything is filled out, then you sit back and pray that F&W clears your import papers. It is supposed to take 3 to 5 days but typically takes three weeks or more in the best of circumstances. If there are problems or issues with the paperwork, it could take much longer to clear, or your shipment could even be seized. Entry has been denied for shipments with misspelled words in the import declaration forms. Whew! This is some scary stuff, and I haven’t even brought up the possibility of an inadvertent Lacey Act violation, which can result in huge fines or jail times for trafficking in any plants or wildlife which may have broken any local laws in a foreign country when they were harvested. Just ask the folks at Gibson Guitars how their lives were ruined due to a shipment of ebony wood from Madagascar (Google it only if you want to get really angry). How do you protect yourself against unscrupulous wildlife suppliers who don’t follow all the rules? Make sure you ask for and receive scanned copies of any and all export documentation and paperwork before you commit to anything. And this is not only for Africa. Even with specimens from Europe or Mexico, if they just show up in the mail, then your are illegally importing them and subject to severe penalties. The same process is required on any wildlife imported into the United States. You must research international, national, state and local laws to make sure you are in compliance. Alternatively, if you want to avoid all this stress and the unforeseen pitfalls, then you can use an import broker to bring in your shipment. There are companies like Coppersmith, Inc. and Flora and Fauna who do this every day. They are familiar with the entire importing procedure and can navigate through the process fairly easily, taking care of all of the details for you. The downside to using a broker is that it will cost you an additional $200 to $600 in brokerage fees. So if you are looking for a bargain, importing wildlife is probably not something you should attempt. If you think importing is bad, exporting is even worse. The departments in charge of export processing are not very efficient. It can take 8 months to a year just to process exporting paperwork. If you have read all this and are still excited about doing it yourself, then take a few evenings and read through the entire eDecs site at https://edecs.fws.gov/eDecsHome.cfm and the USFW Information For Importers and Exporters at http://www.fws.gov/le/ImpExp/Info_Importers_Exporters.htm. I especially want to thank the brilliant Michael Vaden for his valuable advice in researching this article. Disclaimer: I am not a lawyer, so please don’t rely on my interpretation of any of these regulations. Make sure that you personally research any and all laws for your particular situation. The frustrating thing is that many of the public servants interpreting these laws will come to different conclusions. Your mileage may vary. Related article: Protecting yourself from scams on the internet.